Proper time and bankroll management for blackjack advantage players, as opposed to simple strategy players. As one who prefers mobile gambling to the real-life experience, I can attest to the fact that blackjack strategies vary greatly between the two options. You can’t play mobile blackjack and expect to gain an advantage over the dealer, no matter how hard you try. On the opposite end of that spectrum, if you do play in a land-based casino, failure to employ more than a basic strategy comes with equally strict, and wholly contrasting, ground rules for time and bankroll management. As an online or mobile blackjack player, one cannot hope to employ anything more beneficial than a basic strategy that dictates all decisions. Every hit, stand, double or split should be a calculated decision, based not on instinct or intuition, but on mathematical probabilities. Acquiring the perfect strategy chart for the precise rules of the game to be played—that is the key to driving the house edge to an absolute minimum. But that minimum will not be enough to give player’s an edge. At best, you can expect a house edge of ~0.3%. This alone translates to an expected return of $99.70 per $100 wagered; or more appropriately stated, a loss of $0.30 per $100. Based on mathematical awareness, a player’s time and bankroll management should be geared towards slow play and conservation. Look for multi-player games with the most amount of players present. In a single-player setting, it is common to see up to 200 hands per hour. At $5 per play—the lowest possible bet at most land-based casinos—the result is an expected loss of $30/hr. With 6 players active at the table, there should be an average 50 hands per hour; a loss rate of $7.50/hr. Alternatively, a mobile blackjack game might offer smaller wagers of $1 minimum, if not less. If that’s the case, and you don’t play so fast as to exceed 200 hands per hour, your expected loss is even lower; just $6/hr. Thus proper collaborative management of your time and bankroll is paramount. In a terrestrial casino, of course, blackjack players are capable of exploiting multiple strategic advantages. Employing the perfect decision-making strategy is one, followed by the inconspicuous execution of an accurate card counting system. When both are utilized properly, the house edge can turn, ever so slightly, into a player’s edge. This is what we call an “advantage player”. For this player, the opposite time and bankroll management strategies must be employed. Because an advantage player has a positive expectation, the more hands per hour they play, and the higher their wagers are, the better their expected return will be. A blackjack advantage player should be seeking out empty blackjack tables. The fewer players there are, the faster the games will proceed. The most experienced pros will ask for a private VIP table. The stakes are much higher at these games, but because the player is willing to risk more, casinos rarely decline such a request. 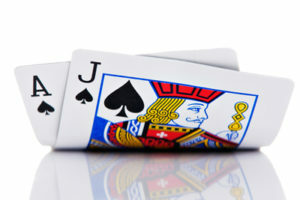 However, if it becomes apparent that you’re counting cards, odds are you’ll be asked to leave, or choose another game.